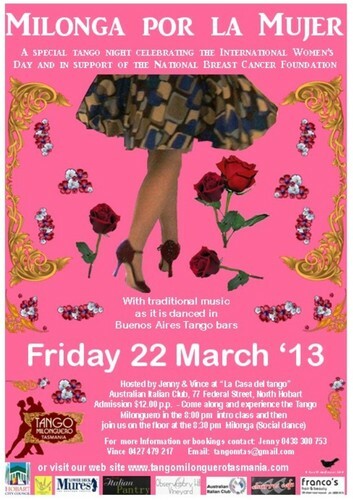 Tango Milonguero Tasmania invites you to a special tango night celebrating the International Women’s Day and in support of the National Breast Cancer Foundation. Join us, experience the Tango Argentino and discover the real tango as it is danced, socially, in Buenos Aires tango bars. Fully licensed bar service available. Beginners and newcomers welcome to attend the introductory class. Admission includes 8.00 pm intro class - 8.30 pm Milonga (social dance). For information contact: Jenny 0438 300 753 or Vince 0427 479 217 find us on Facebook.